The month of March has been absolutely whirlwind between cakes, Canada classes, the next round of classes in June 2012, and other exciting projects in the works. We've been on a non-stop adrenaline rush since the month started and its leading right into the month of April! If you are a follower of "Musings from Cakeland" blog, you know we recently returned from Canada where Rick was teaching 2 classes. We left for Ontario on Sunday, March 6th. 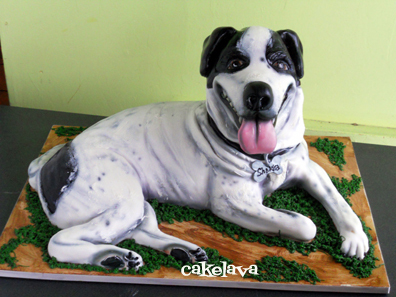 The last cake that left our shop was in the evening of Saturday, March 5th when Rick had an opportunity to make this super cute half Chinese Sharpei, half Australian Cattle dog mix, named "Shakira". We were excited to make "Shakira" sculpted out of cake for our client, who has previously ordered cakes from us before and always brings us fun and interesting projects to sculpt. How could we not fall in love with a doggie this cute. 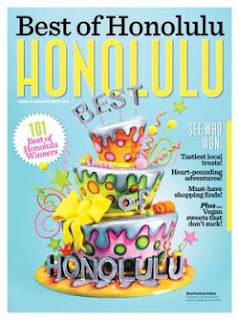 To see this face right before we left Oahu was a wonderful goodbye! Rick sculpted "Shakira" completely out of cake and had him relaxing in the grass. The cake was a gift by our client for a friend of hers and she was thrilled with the cake when she saw it. We had grown slightly attached to the dog in the process of making him and it was nice having that spirited dog energy in our shop shortly before taking off on our big adventure. A huge thanks to our client Traci for introducing us to the loveable Shakira! The last time we blogged was a day before we flew to Kitchener, Ontario, where Rick made his teaching debut at Icing Inspirations. It was a 9,000 mile journey round trip -- 10 hour plane ride each way -- and nearly 2 weeks away from our shop and life on Hawaii, all for the sake of sharing artistic knowledge with 37 students and meeting new friends over the course of 6 days. Was it worth it? Most definitely!! It was Amazing! Truly a fantastic experience that is hard to put into words because so many new memories were created in less than 2 weeks. Our hosts, Chrissie and Justin of Too Nice to Slice/Icing Inspirations are truly wonderful people and took care of us, from the second we landed in Toronto, shuttling us back and forth from our hotel to the their shop where the classes were held, to meals after the classes, and regular stops at the local Tim Horton's for coffee and doughnuts. They treated us like they were a member of their family and let us take over their lives for the duration of our visit. Cake designer Carrie Biggers of "Carrie's Cakes" and TLC's "Ultimate Cake Off" flew up from Utah to take the class and assist Rick when needed, as did Chrissie and her assistant Kellie. Carrie is a real sweetheart in person and a wealth of knowledge on everything cake! We were so comfortable around our new friends even before the classes started. Rick taught two 3-day "Discover Your Inner Artist" classes to a group of 17 students each. 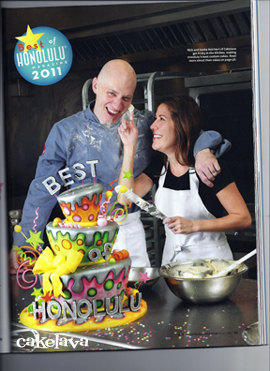 Students learned how to make Rick's hibiscus with bamboo cake, a cakelava signature design and also a colorful sculpted clownfish in coral composition. The classroom he taught in was incredible! Each student had at least 4 feet of working space to themselves and their own airbrush, which definitely made for some interesting memories, if you can imagine what would happen when 17 people are using an airbrush at the same time. It brought back memories of our living in Los Angeles, except the air was a lovely green hue. 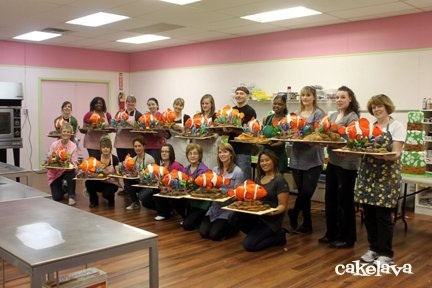 We have posted numerous photos taken during the class on our cakelava facebook page if you want to see them. Rick loved teaching his students and the students really enjoyed learning from him and by the end of the first class, numerous people had inquired if he would be back to teach again and this continued with the second class. Having had such an amazing experience in Kitchener, ON and a lot of positive feedback from the students and our hosts, we were ecstatic when we were invited back in 2012 to teach another course at Icing Inspirations! 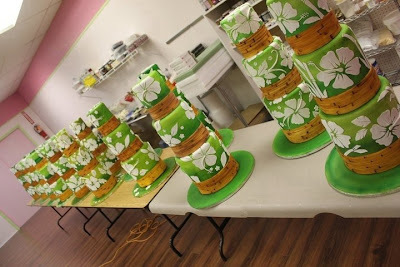 We started with a single 3-day class, with the cake designs as yet to be determined, to be offered in June 2012, and the class sold out in less than 48 hours, with all the spaces grabbed up by his students in the classes that just occurred. A second class was added and we have heard that it is almost half full already! 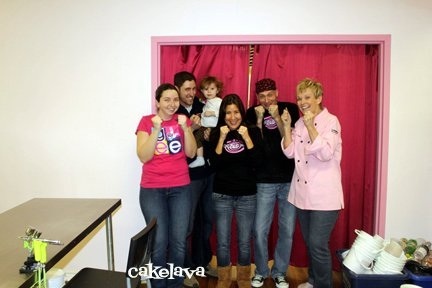 www.cakelava.com -- We're all SO EXCITED to come back again! 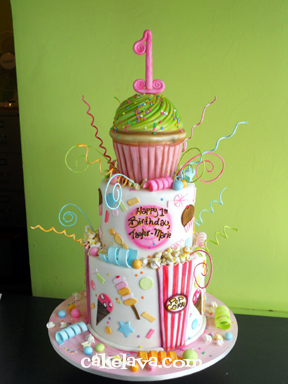 You may contact Icing Inspirations directly at info@icinginspirations.ca to be placed on a wait list for either class. Status: OPEN. Spaces going fast. We will make an announcement on the blog and facebook once the class projects have been finalized. We also would like to acknowledge the ongoing requests we are receiving to have Rick teach outside of Canada. While there may be other locations added in the future, currently Canada is our only destination, as it is logistically difficult for us to travel frequently with our schedule in Hawaii. As other locations become available we will post them. Icing Inspirations welcomes any students travelling from the U.S. or abroad and are happy to help with accommodation information. Thank you to everyone who has shown their support with his classes, including our wonderful hosts Chrissie and Justin, all our students, and other cake artists! So Excited!